Not only is Shelburne home to iconic Vermont brands (Vermont Teddy Bear and Shelburne Farms, to name two); our quiet town is home to a strong, and growing, community of hard-working, passionate artisans. They do things by hand, they follow their hearts and they produce incredible products. Here are some to check out. Kevin and Laura Toohey, with their son Ronen, make each and every chocolate truffle by hand here in Shelburne. In fact, Studio Cacao was the first tenant to join Vermont Artisan Village back in 2012. Kevin, a trained chef, recently returned from a week at the L’Ecole du Grand Chocolat in New York City excited to tweak his silky-smooth truffle. “When a truffle is made properly,” he told us “it is super light and carries flavors well. I want you to bite into one of our truffles and get a real burst of flavor.” Sounds great to us! Toohey is currently at work perfecting a fleur de sel caramel and truffles infused with rose geranium. Check Studio Cacao out online and in the Burlington Town Center Mall on Church Street. 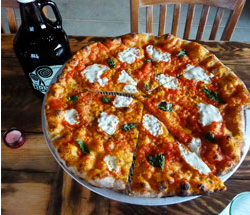 Folino’s Pizza, housed in a shared space with the award-winning craft brewer Fiddlehead Brewing Company, has a simple mission: To Make the Best Pizza. Fresh dough is made daily and shaped, by hand, into pizzas scattered with simple toppings. Every pie is baked in a 1000-degree brick oven to bubbly, charred-crust perfection. Wait! Before you take that first bite, don’t forget to grab a growler of Fiddlehead’s funky, citrusy IPA. Chef Courtney Contos is a Chicagoan by birth, a chef and a consultant who has worked with Charlie Trotter and Martha Stewart. She recently opened a kitchen store in town where she sells a curated selection of cool stuff for the kitchen and home and hosts cooking classes. We hear that she recently hosted an Apple Cake Cook-Off and Fall Party. She makes us excited about food and is a vibrant personality. Plus, she’s launching a culinary tours business and has one of the best foodie Instagram feeds around. Located across the street from Vermont Artisan Village is Shelburne Vineyard, a pioneer in the Vermont wine industry. Shelburne Vineyard harvests almost 20 acres of grapes every year to produce award-winning wines like their Marquette, made from a red grape cultivated to thrive in cold-climates like ours. The Vineyard practices sustainable agriculture. The Winery is open seven days a week for tastings and tours. We’ll often pick up a bottle of Marquette and a few pizzas from Folino’s to bring home for dinner. Elizabeth Archangeli and Angie Lizotte are the designers behind Cricket Radio Linen, which makes beautiful linens and other gorgeous goods like pillows, aprons and the most adorable baby onesies! We are thrilled to have Cricket Radio onsite at Vermont Artisan Village. Their products provide a beautiful backdrop for beautiful food. Cricket Radio’s designs are influenced by Indonesian batiks, vintage Americana and rural Vermont and have a decidedly Martha Stewart-meets-etsy flair (no surprise, they were finalists last year in Martha Stewart’s American Made Awards). This country store, right off the Shelburne Green, dates back to 1859. Like any good country store, the Shelburne Country Store has anything and everything, including rubber duckie stickers, Bite Me boxer shorts, maple candy, handmade bracelets, scarves and authentic Vermont beef jerky. The collection, and store, is managed by Steve and Deb Mayfield. What are some of your favorite Shelburne-and-area artisans? Please check out our Facebook page and share your ideas there.